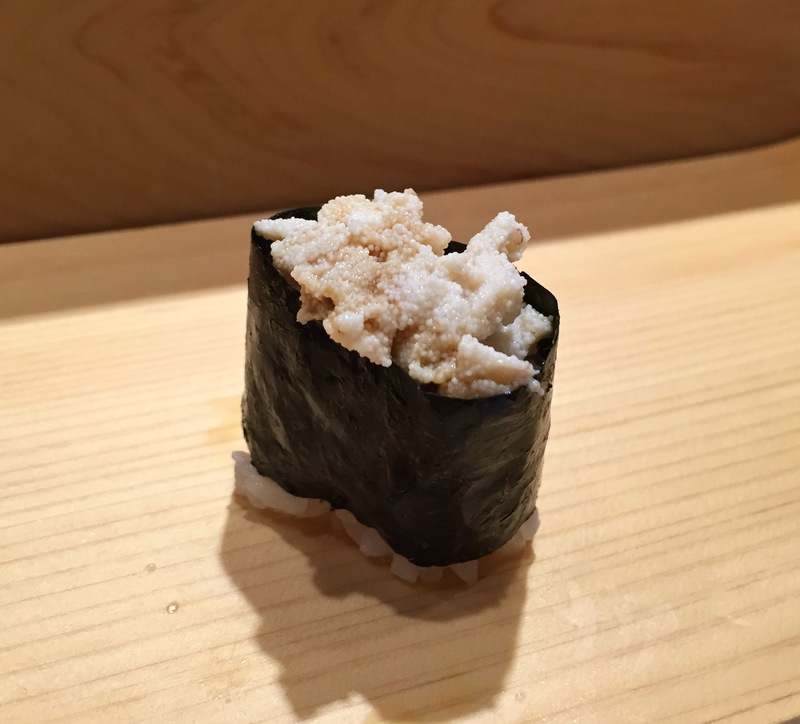 Omakase sushi is the dream meal for someone with attention deficit disorder. 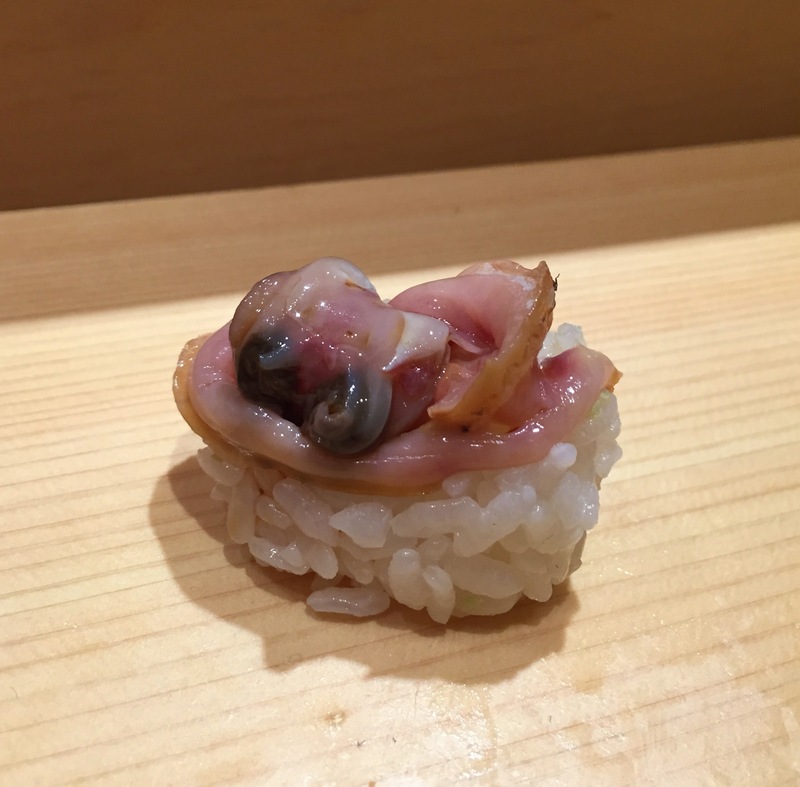 This particular thought kept running through my head, as piece after piece of sushi, each unique and enthralling, was placed before me by the hands of a master, and self-proclaimed “sushi mensch,” Chef Naomichi Yasuda. Each bite-size piece commanded my absolute full attention, activating a different combination of tastebuds–translating into a different taste profile–from the next piece. Many will know Chef Yasuda as Tony Bourdain’s good friend and sushi mentor from Tony’s visit to Tokyo on his Parts Unknown show in season 2. Others will recognize Chef Yasuda’s name as the legend behind his longstanding and wildly popular, eponymous Sushi Yasuda in NYC. 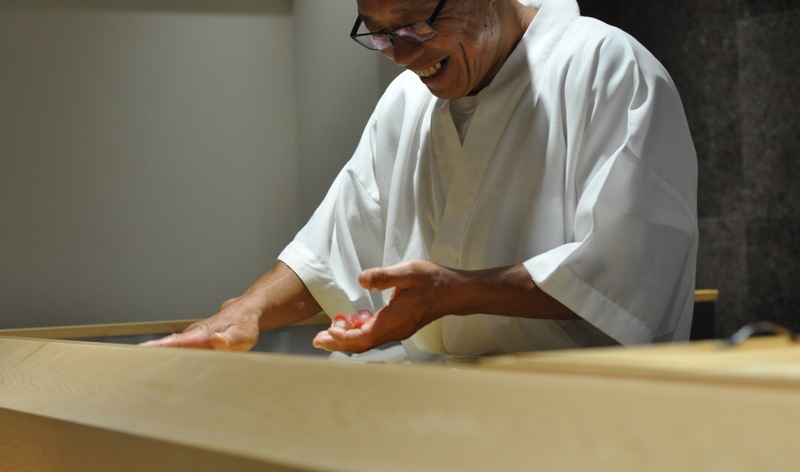 In 2011, in an effort to regain his creative culinary voice (amongst other reasons), which seemed to have been stifled in the day-to-day administrative duties at Sushi Yasuda, Chef Yasuda bid farewell to New York after 27 years, and moved back to Tokyo. 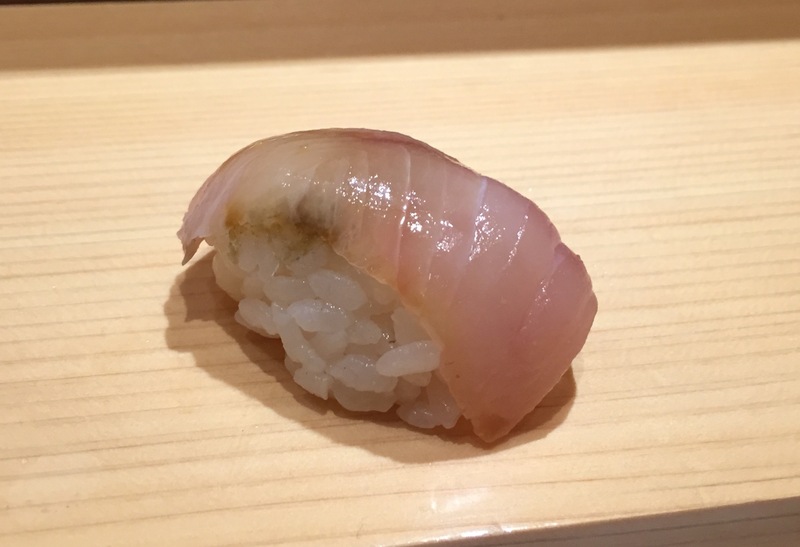 Quietly, he opened a small 8-counter seat sushi bar, Sushi Bar Yasuda in Minami-Aoyama. It was here that he reclaimed control over all aspects of his restaurant–his menu, the staffing, the service, the ingredients, his food, and the culture. 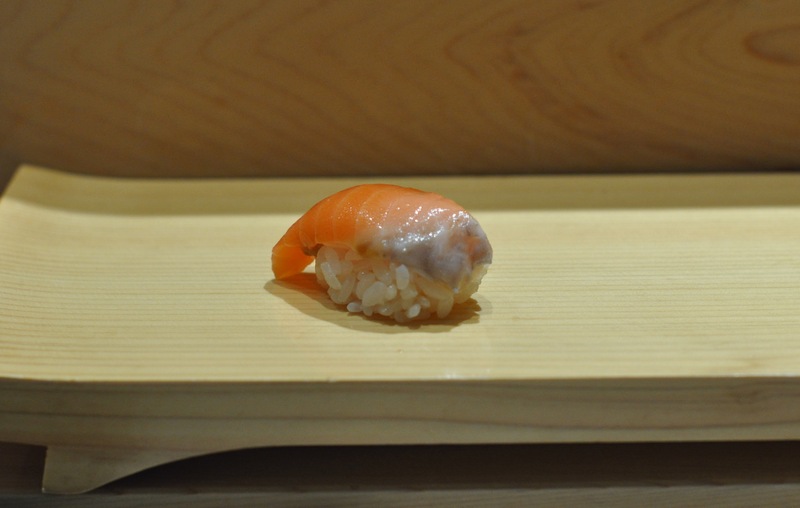 And this is exactly where we wanted to have our first real omakase sushi experience in Tokyo. 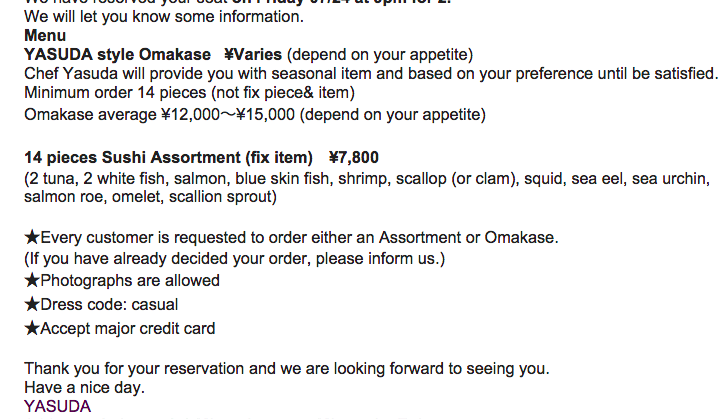 Chef Yasuda’s email with menu and restaurant info. We arrived 15 minutes early, and descended (the restaurant is in the basement of an office building) toward sushi promiseland. With a quiet nod, Chef Yasuda welcomed us. As the 3 staff members prepared our seats at the counter, we sat and waited briefly at a small table, used for additional diners. Which, by the way, I do not recommend sitting at, because you will miss the full experience. The restaurant was bright and warm, made so by the blonde furnishings and white walls. We sat at the counter, next to the only two other diners in the restaurant–two guys visiting from New York–and who had obviously dined many times previously at Chef Yasuda’s restaurants. In hushed voices, Mr. S and I both selected the omakase, sake (from Chef Yasuda’s home, Chiba prefecture) for me, and a beer for Mr. S. The heavy silence of the restaurant made us feel a palpable intensity at first, which soon was allayed, as Chef Yasuda started to chat with us, immediately firing out a series of jokes, putting us at ease. Below, in pictures, is what we ate, drank, and enjoyed with abandon over the course of two hours. Be warned it is a ridiculously gluttonous amount of food–between Mr. S and myself, we tasted a total of 31 different kinds (56 pieces total) of nigiri and maki sushi. As Chef Yasuda paced us through each and every delicious component of the evening, he explained what each piece was, and answered all of our questions in his near-fluent English. Some pieces were just good, some outstanding, and some that completely turned upside down any notions I had of what “good” sushi was because these were so f**king delicious. A word about Chef Yasuda’s rice. It is quite possibly the best quality sushi rice (shari) I have had. Plump and slightly toothsome, each glistening grain of rice is seasoned with a mixture of tangy vinegars. 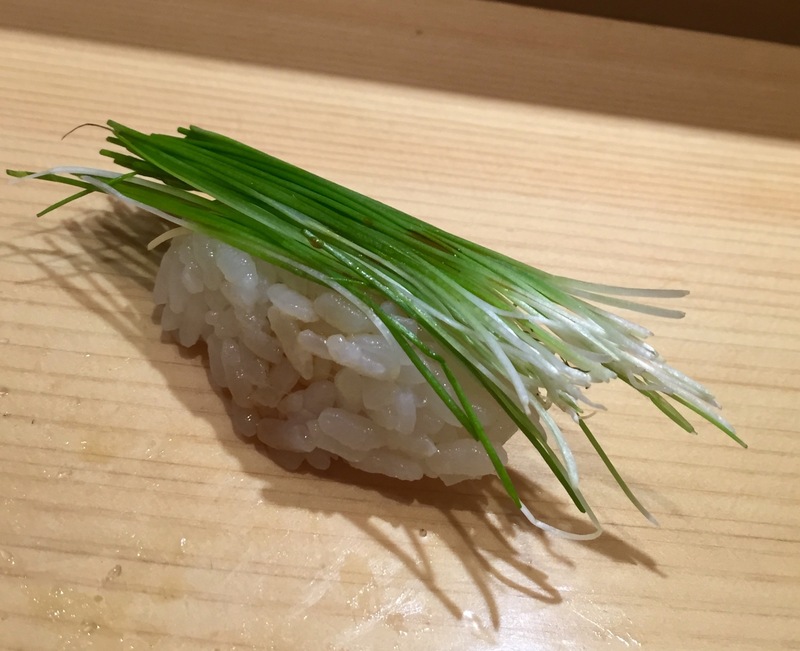 “The rice is 90 percent of sushi,” Chef Yasuda proudly states, a belief held by most respected sushi chefs. His particular rice, of which he has everything to be proud of, is from his hometown of Chiba. Throughout the evening, his hands worked so fast to mold each piece of shari–to prevent heat transfer. 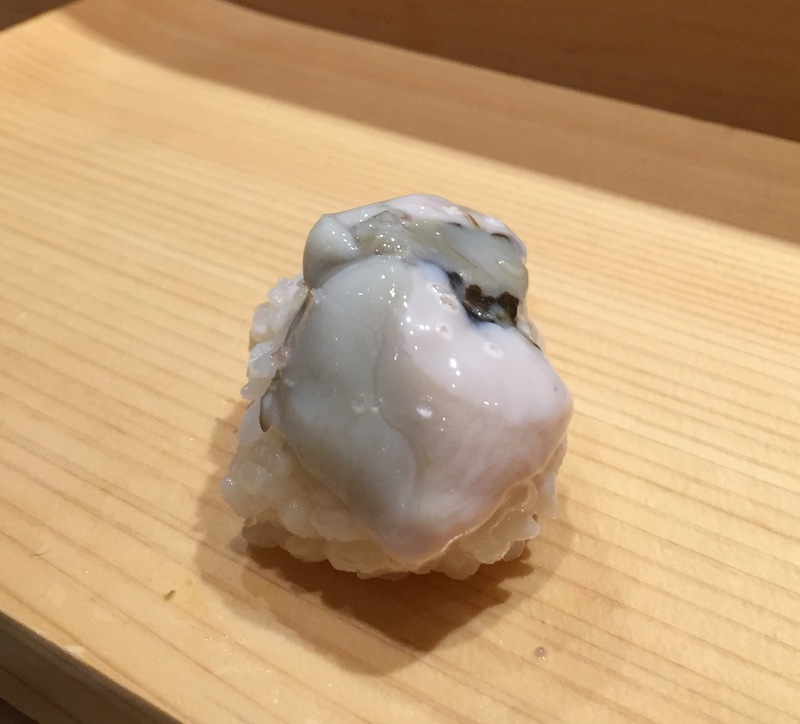 A perfect mouthful, each ball of rice was packed, but not densely, so that it gave way in the mouth to reveal a wonderful acidity and sweetness. As the first nigiri of the evening, the angelfish set the mood right. Sweet to start, with a briny finish, this was a mild, white fish that was a good intro. The sourness of the shari rice stood out boldly next to the lightness of the angelfish. Chef called this “Steelhead Salmon,” which in fact, is steelhead trout, a fish that is part of the salmon family. Cut thin, the medium-oily fish draped nicely over the shari. 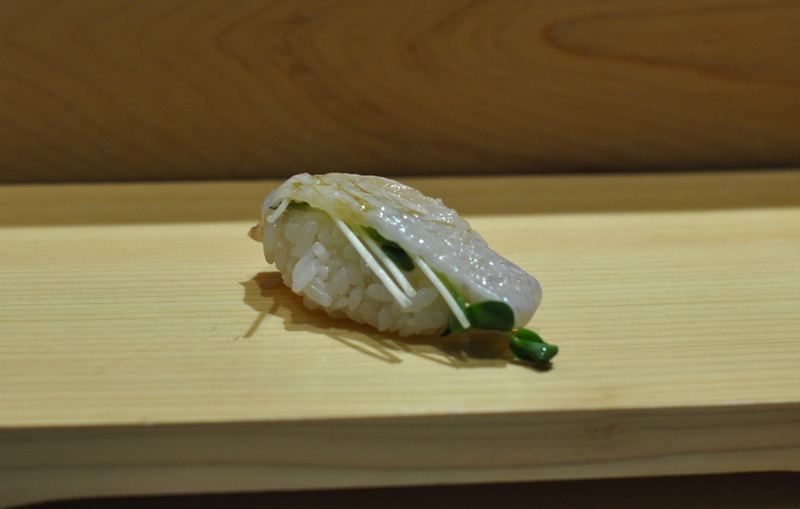 Tilefish has more natural oils, so Chef Yasuda paired this with a bolder, more strong wasabi. I felt this in my nose and sinuses; very bracing. King Salmon is a Pacific salmon, with a high fat content. This piece was rich and flavorful. Chef jokingly called this the “forearm” of the fluke fish. 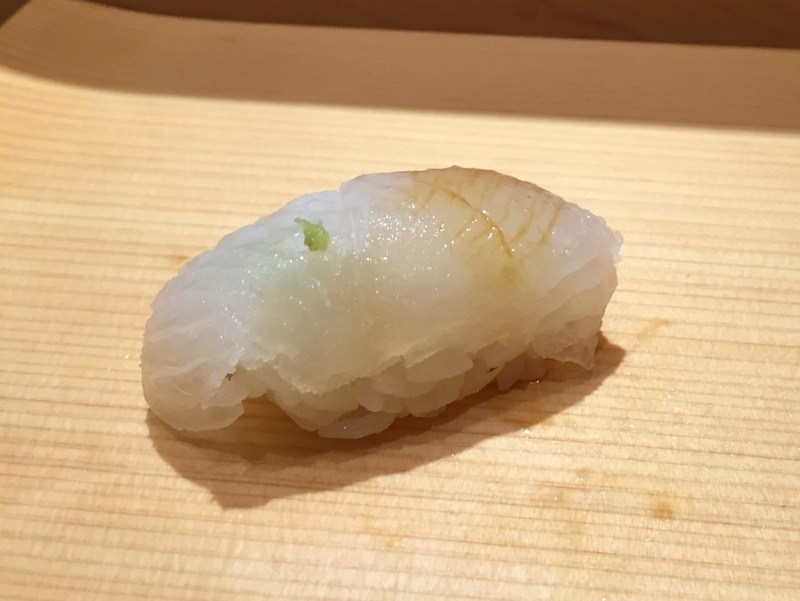 As the chewy part of fluke, this piece of engawa was sliced thin, and paired with Chef’s special shoyu and sprouts for a clean finish, and textural counterbalance. 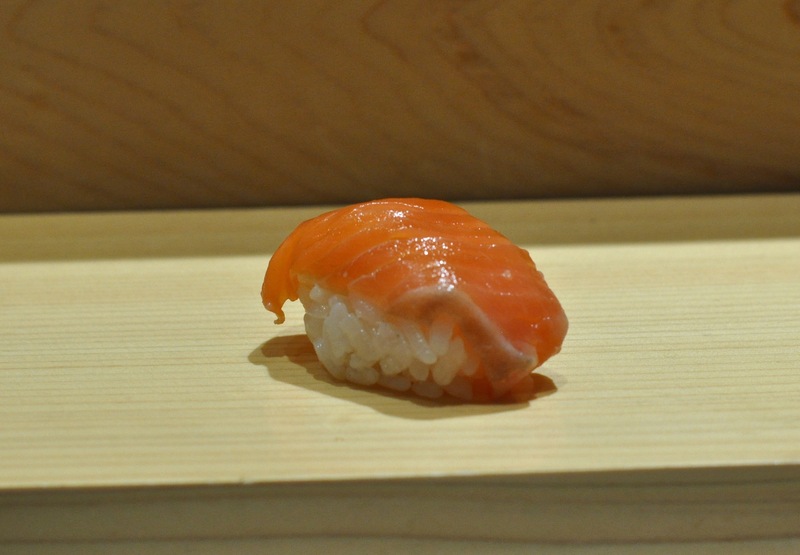 Lean maguro has a wonderfully uniform, firm texture that stands up very well to the chewy rice. 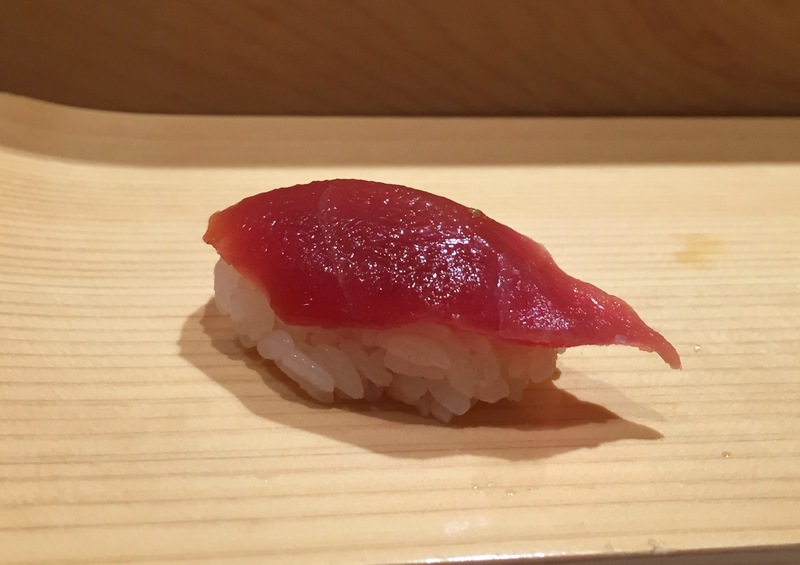 Although maguro is not my favorite (I much prefer fattier cuts of tuna), this piece had great pure tuna flavor. 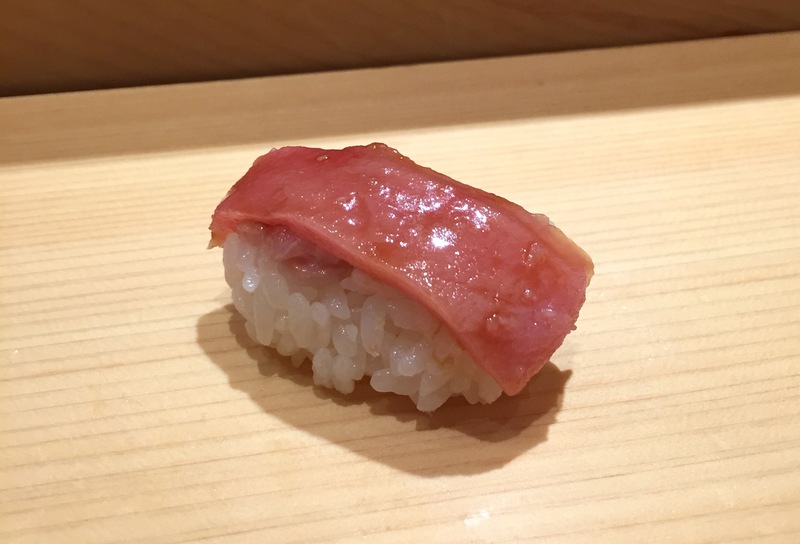 Chef did not specify this was otoro or chutoro, but from the looks of it, I would characterize it as the medium-fatty tuna. 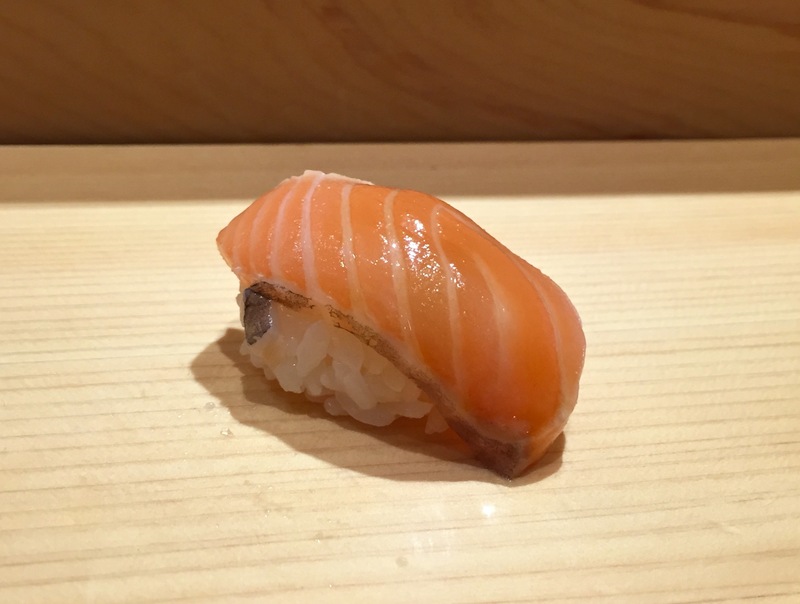 “Toro is a concept, it is not a part of the fish,” says Chef Yasuda. This is because “toro” is derived from a Japanese word that means “to melt.” This piece did just that–a soft, slow melt in the mouth–just brilliant. More lean than hamachi (yellowtail), amberjack has a wonderful sweet fish taste. I was surprised to see a third fish from the salmon family this soon into the meal. This piece was more sinewy than the other King salmon or steelhead trout, but was certainly not unpleasant in taste. This is where things got interesting. At this point in the tasting, Chef started to tailor the pieces based on our preferences. Because I had stated I “loved” uni, this piece was for me, but not Mr. S. This uni (a purple sea urchin), from Hokkaido, was sweet and mild, and reminded me of the urchins I caught at Half Moon Bay in California. The texture was slightly runny, which tends to be true of purple urchins because the urchins are naturally smaller and uni more delicate. Mr. S’s piece was mackerel because he told Chef he greatly enjoys mackerel. Oishii, he reported. Chef says he freezes the mackerel to “cure” it. 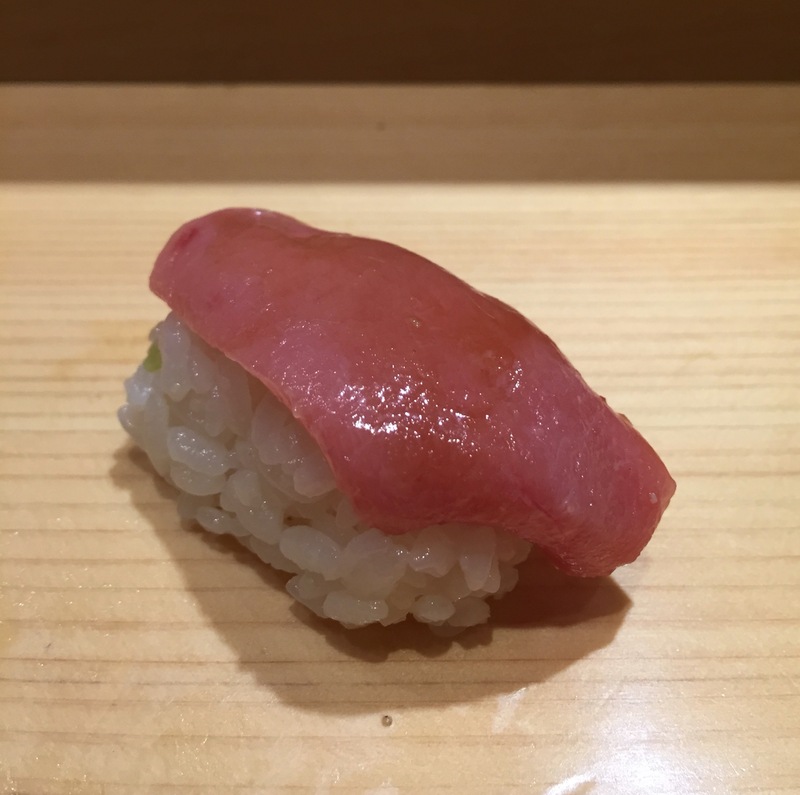 Many varieties of fish, Yasuda taught us, are in fact, improved by freezing, such as tuna. My next piece was uni from Russia, to compare and contrast with the Hokkaido uni. A world of difference. 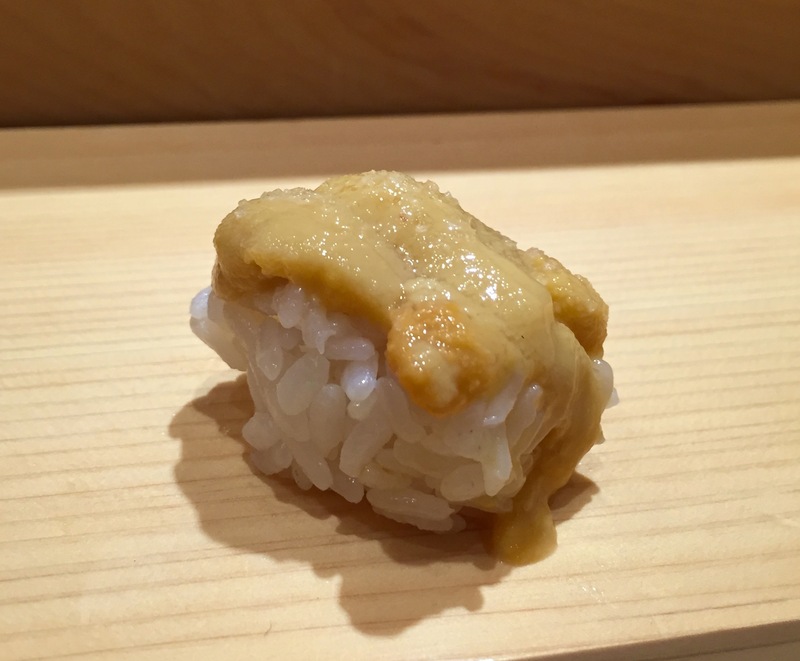 This uni was very obviously more salty and briny, with none of the delicate sweetness of the Hokkaido uni. Chef sprinkled sea salt on this to highlight the savoriness. While I had Russian uni, Mr. S had fluke: a mild, white fish. 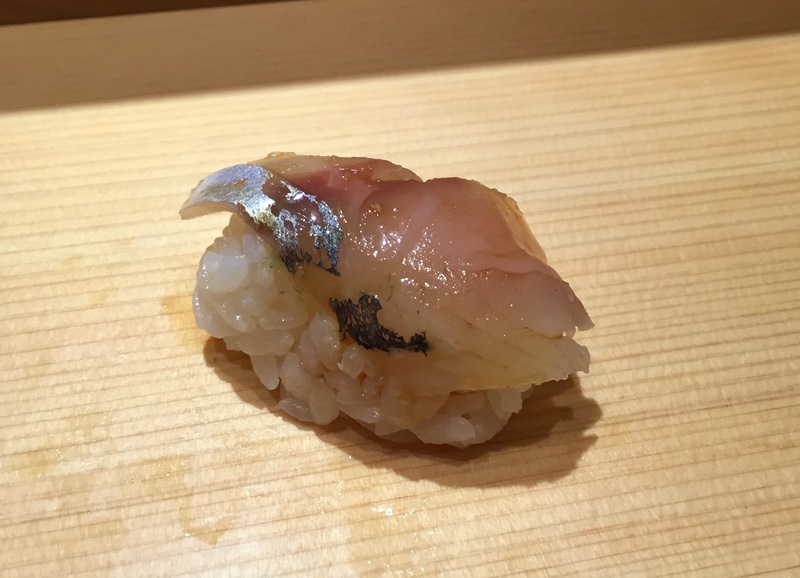 Mackerel eggs is something new that I have never tried before, and so it was extremely interesting. Surprisingly light and mild, without the buttery or creaminess of other types of fish eggs. Texture was reminiscent of soft scrambled eggs with the small curdles. 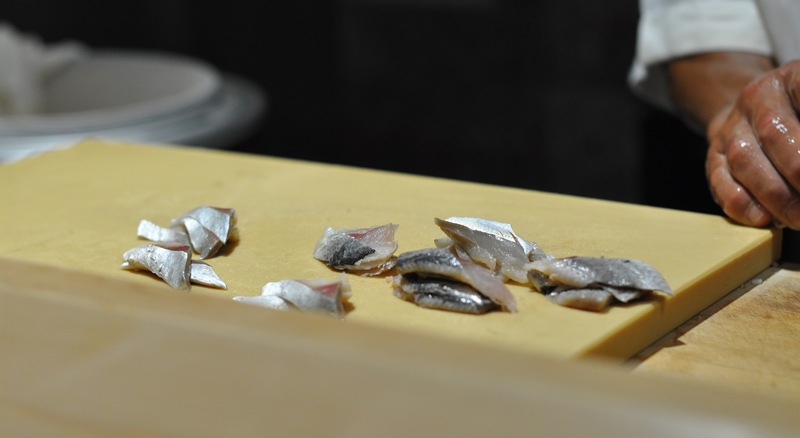 Rich and oily, the flavors of the herring were bold and provided a nice contrast to the previously mild mackerel eggs. This was the most attractive piece of the evening with its bluish, silvery skin. 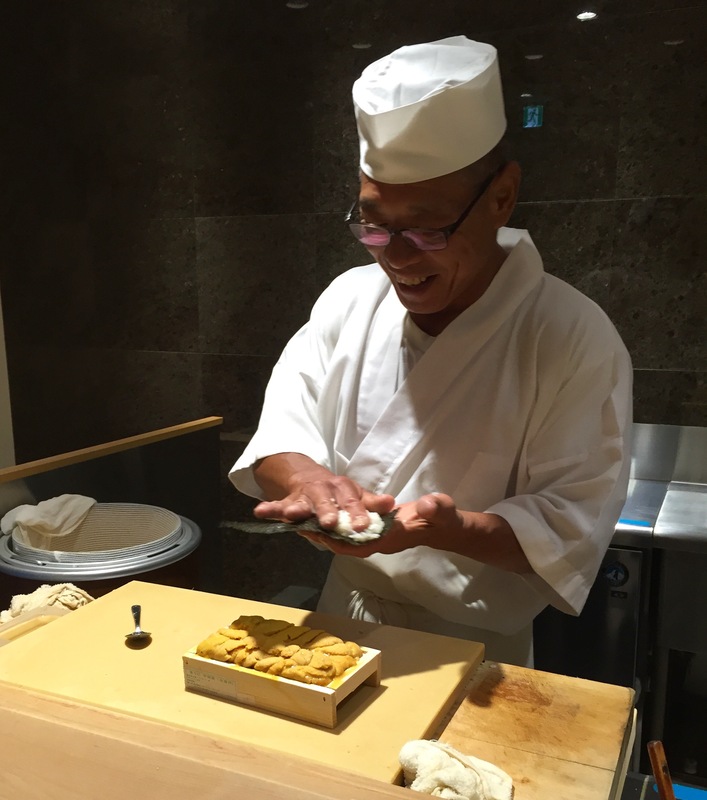 Chef Yasuda scores the fish in order to release the natural oils, as well as for the fish to mold better to the shari rice below. Chef says this is one of his favorite fish. 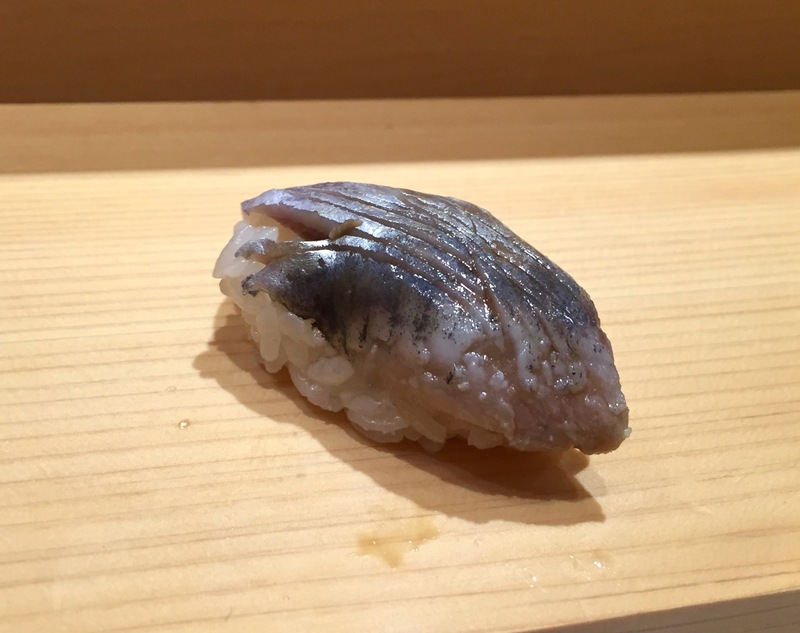 A local freshwater fish, ayu has a naturally bold sweet taste. 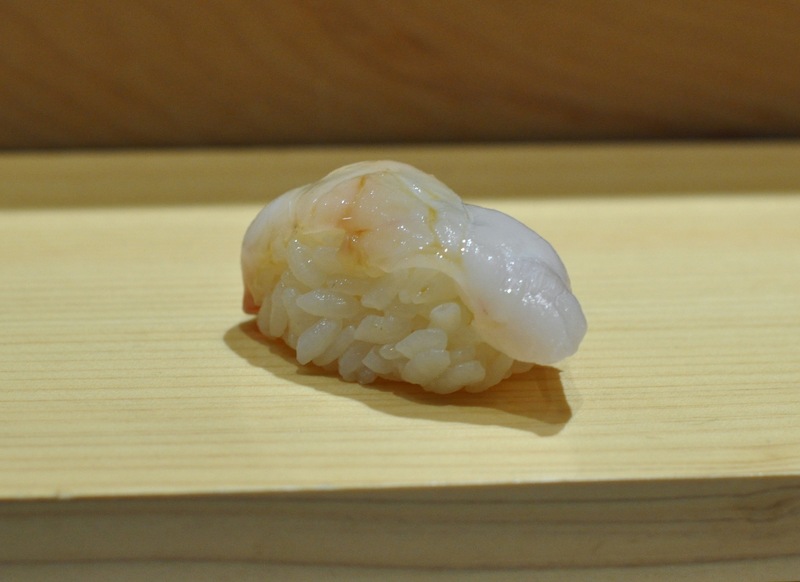 Himo is the “fringe” (inner portion) around an Akagai (ark shell clam). 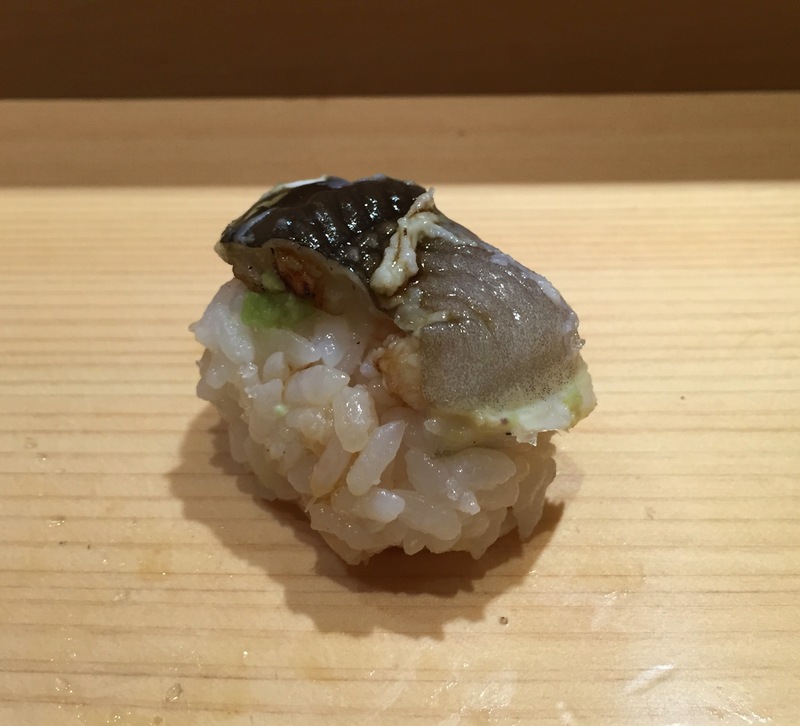 Chewy with sweet, Chef compared this piece of the clam to a jigalow…. someone who doesn’t work very hard and lives off others? Lol. Delicious, meaty, and sweet. A very true shrimp flavor. Chef showed us the entire oyster before he started to cut into it, and it was gigantic. The resulting piece was sweet, briny, and creamy in texture. One of my favorites of the evening, this scallop was brilliantly sweet and delicate. For contrast, Chef brushed on shoyu, sprinkled sea salt, and drizzled some fresh lemon on top. The combination brought out the naturally subtle sweetness of the scallop. I normally do not like squid because of its gummy and almost slimy texture. 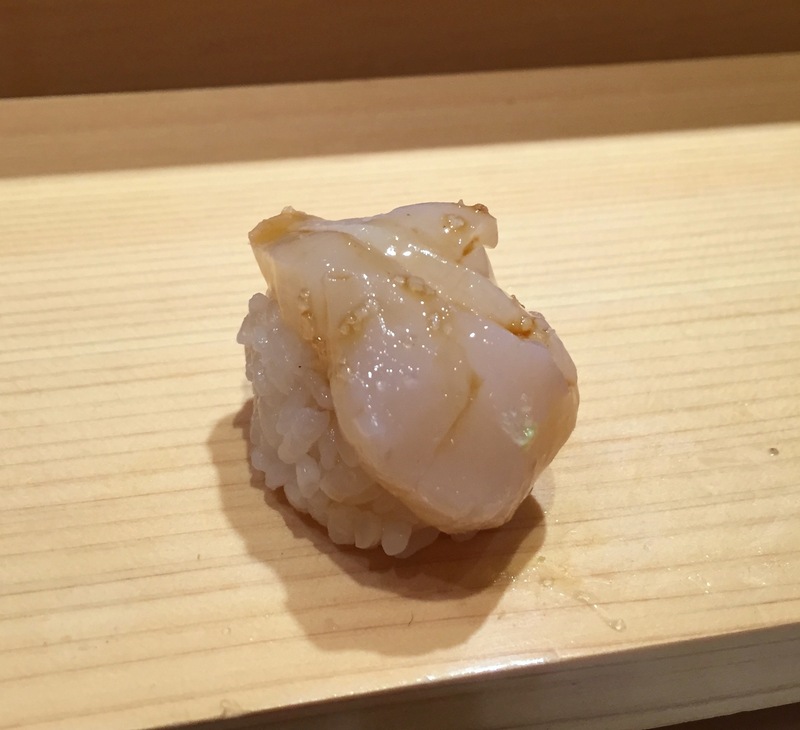 However, this particular squid had a similar delicate texture to the previous scallop, with a creamy finish. I may have just become a squid enthusiast. 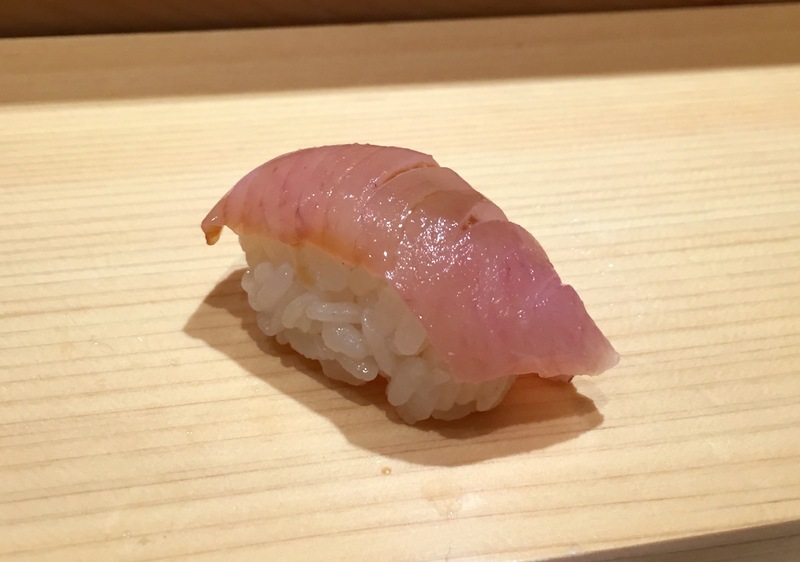 This piece of otoro was more pink that I have had at other restaurants, and with less fat marbleization but still had a wonderful taste. This was a thicker cut than the toro from Ireland, and thus, had a bolder taste that lingered far longer. Chef Yasuda called this “squid face,” which I gather he means not the tentacle or body, but rather, the portion located more centrally on the squid. It was more chewy than the squid body. It had a delicate taste that I felt like was overpowered by the strong-tasting nori. By far the largest piece of the night, I had to eat this in about 3-4 bites. 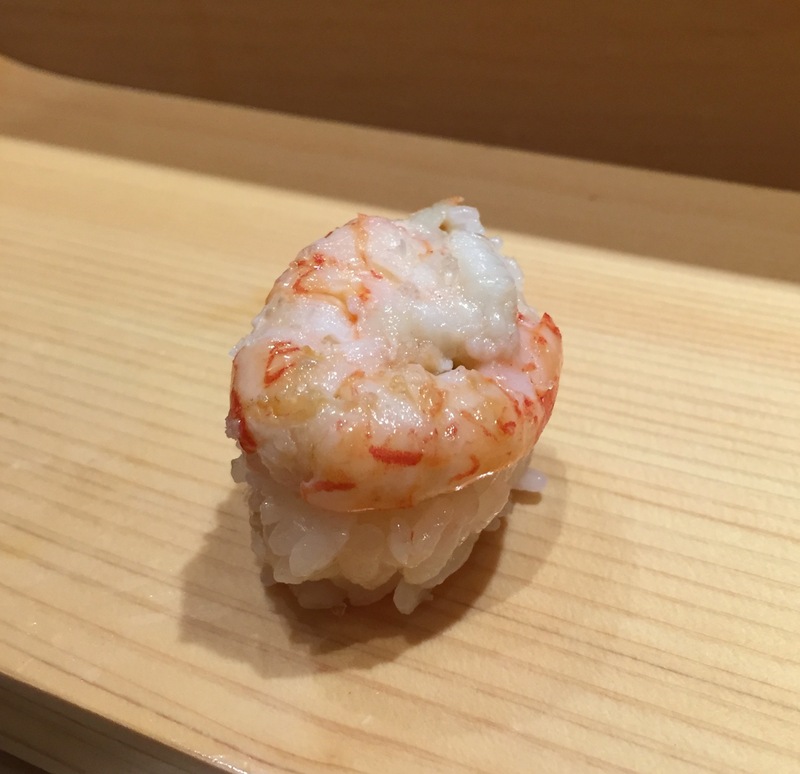 It reminded me or a langoustine, and had a sweet, pure shrimp flavor. Very satisfying because it was very meaty, like lobster. 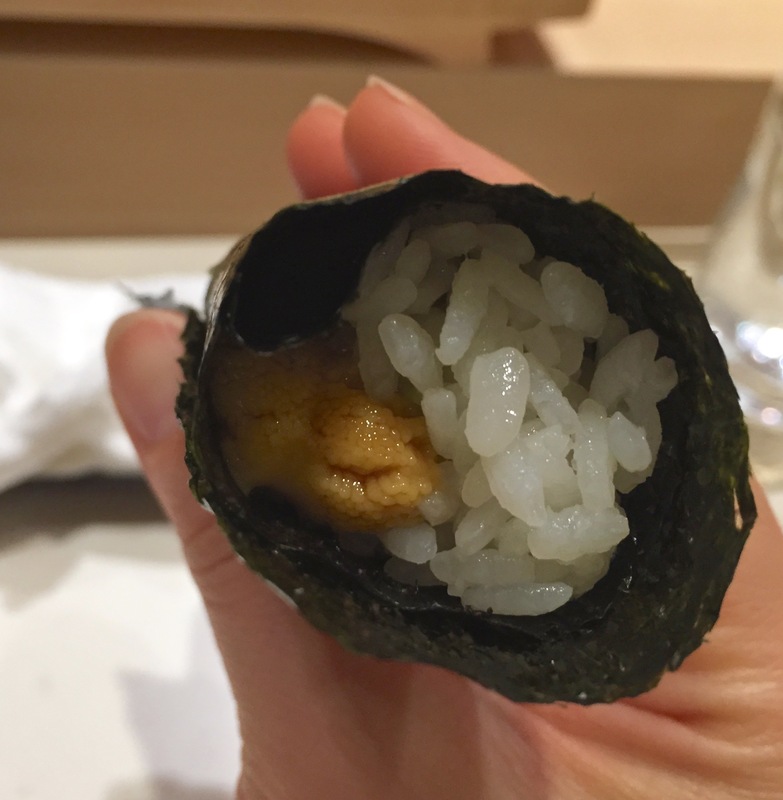 A diner next to me special ordered a uni roll, so naturally, I wanted one too. 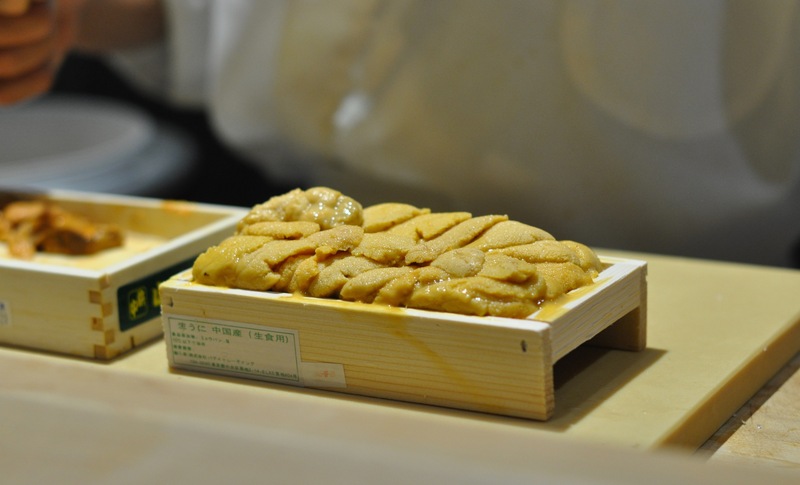 Chef Yasuda used a 3rd type of uni of the night, from the Northern China sea. 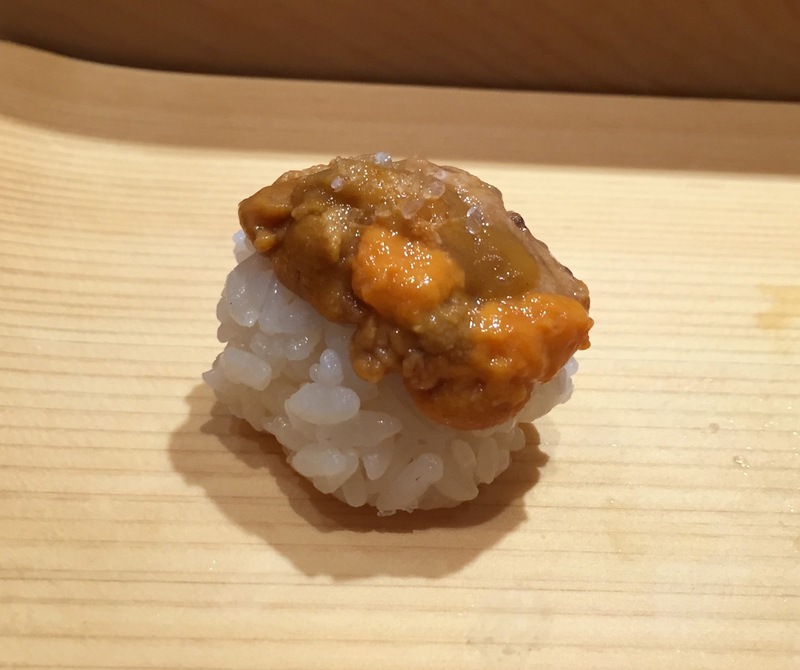 This uni had a more traditional uni flavor, meaning, something more commonly found commercially in the U.S. Not as sweet as the Hokkaido uni, but still very good. The texture was more firm. 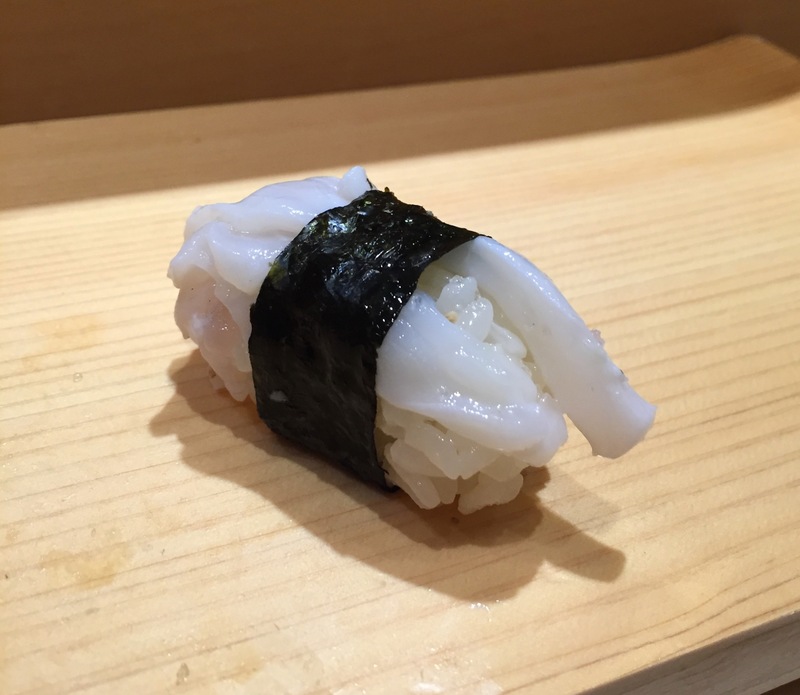 Chef talked much about his quality of nori paper–the highest quality available. Actually, it is “gift grade” and not typically used in sushi restaurants, but Chef prefers this over the more common kind. 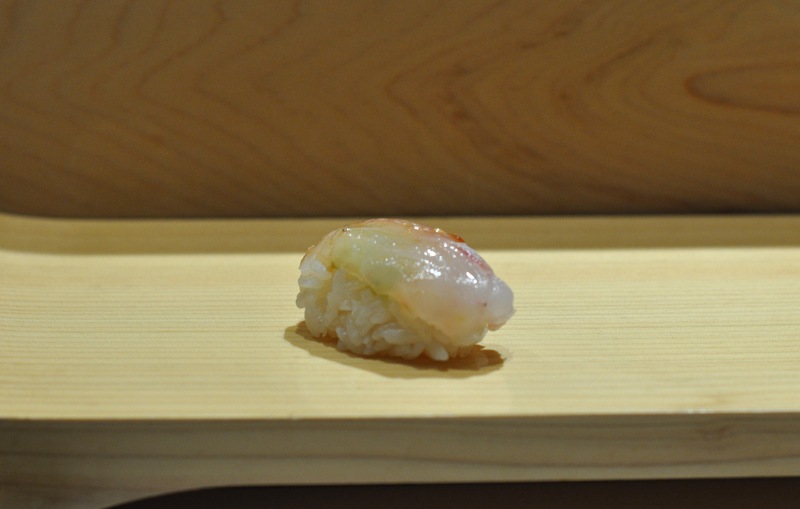 A wonderful palate cleanser, menegi was delicate and crunchy as well. These tasted of young leeks rather than scallions. Very grassy and refreshing. Another favorite of the night. Chef sears the anago over a grill, giving the skin a crispy, roasted flavor, and leaving the insides creamy and warm. The anago has a naturally sweet taste, which is brought out by a swipe of his special shoyu. 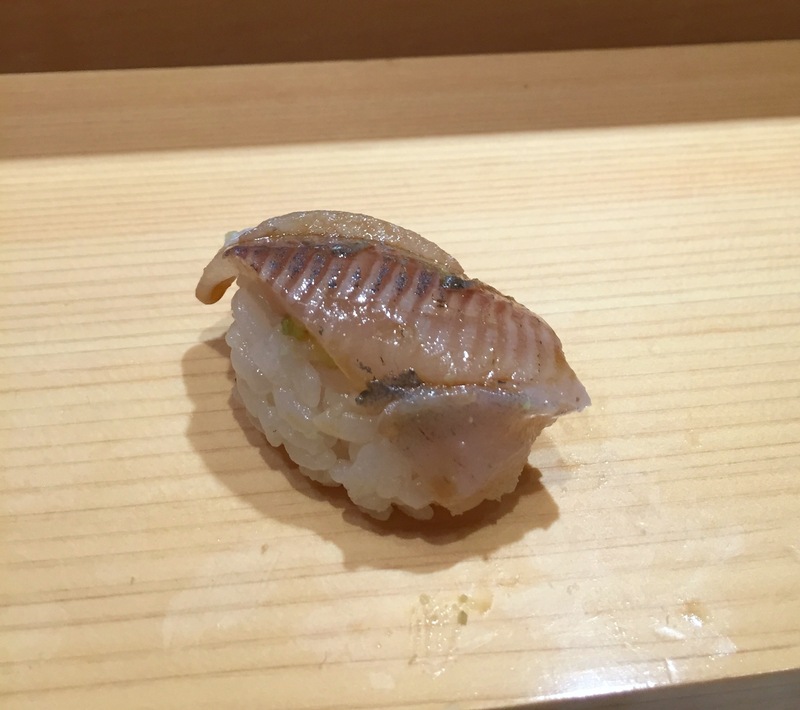 Typically at sushi restaurants, anago is smothered in sweet eel sauce that destroys the eel flavor. Not so here. 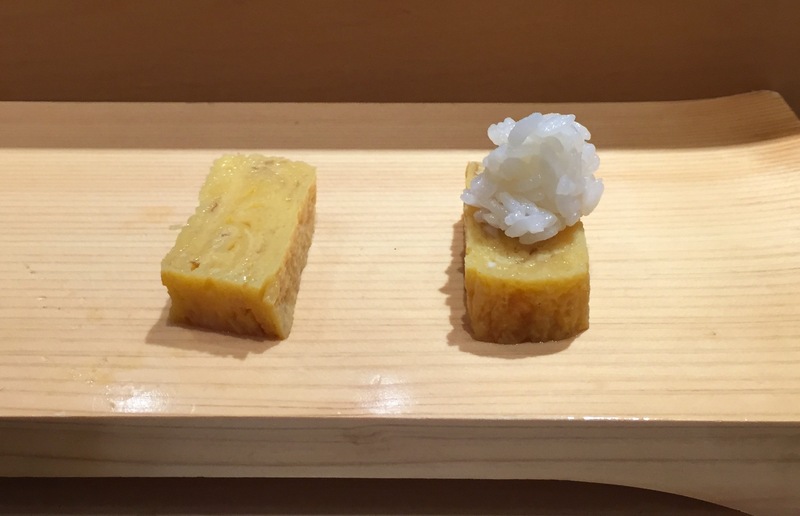 To end the evening, tamago is traditionally as a last course–a sweet. The same diner next to me ordered it, without rice, and so I also asked for it. Chef recommended it with rice, so he gave us some options to compare. He was right, with rice was much better. This is because the tamago is very sweet, and definitely needs sourness of the rice for balance. The tamago is served chilled which is very interesting. As the counter started to fill up again after 9:30 pm, we dined throughout the rest of the night with five other English speakers–two visiting from Singapore and three visiting from the U.S. We watched “the sushi man” in action as he conversed and joked with each of our groups, and often, all of us at once. 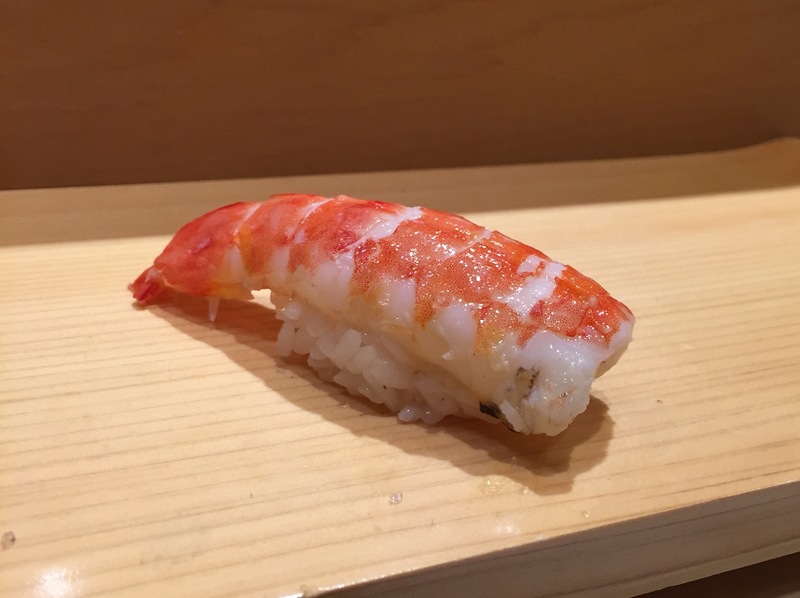 This is what is unique about dining at Sushi Bar Yasuda, as compared to other high end sushi bars in Tokyo. Chef Yasuda is highly interactive, loves to talk and teach, and has a wicked sense of humor. From what I can remember, there were jokes thrown around through the evening about jigalos, and comparing a uni maki roll to rolling a “Dutch Master,” amongst others…We laughed, learned more than we ever expected, and savored everything from the food, the drink, the company, and the conversation. At the conclusion of our evening, around 10:50 pm, we watched as Chef Yasuda broke down his mise en place, and took off his cap and chef’s happi coat, revealing a burly body-builder’s torso, ripped arms, and thick neck and shoulders–a product of years of weight-lifting and bare-knuckle Kyokushin karate. He is famous for his signature pose if you ask him for a photo: a bicep flex and a gleaming smile. Our bill was reasonable for the sheer amount of food we both had, the time we spent there at our leisure, and the priceless sushi lesson we received. For 56 pieces of sushi total, 2 sakes, and 1 beer, our bill was ¥40,100 (about $320 dollars). This is a virtual steal compared to other sushi tasting menus, some starting at ¥31,500 per person (for about 20 pieces). 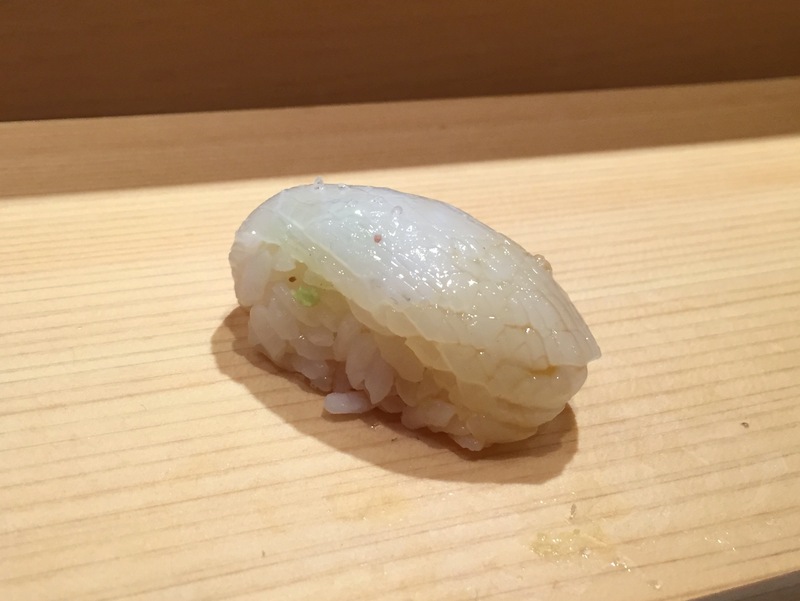 I’ve read some other diners’ reviews stating there is better quality sushi at other restaurants than what you get at Yasuda. As a reviewer, I readily acknowledge to each their own. 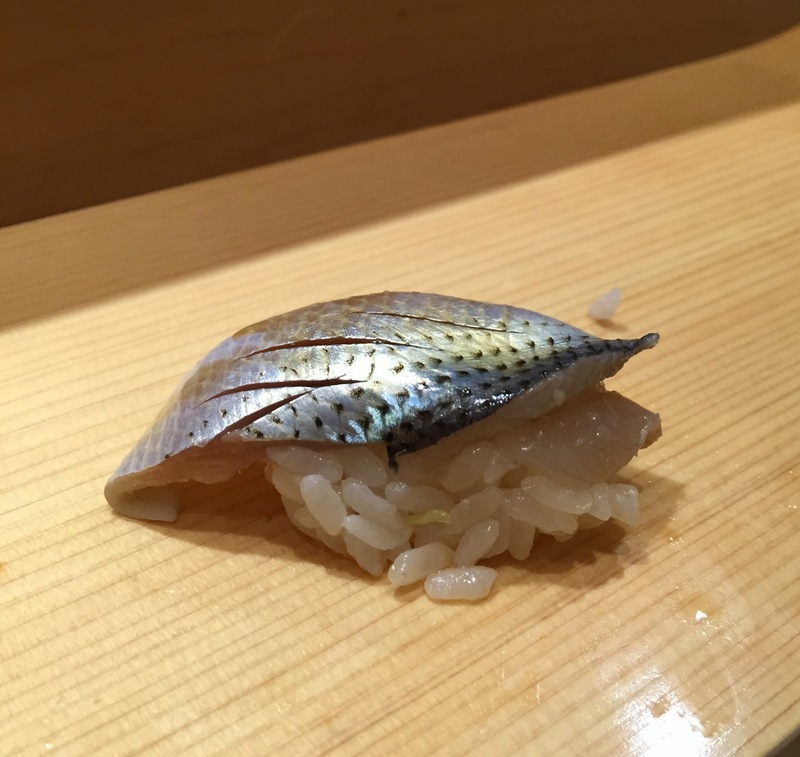 I however, can only speak for our experience that night, and we could see and taste how Chef Yasuda intended for each piece of fish or topping (neta) to complement his excellent rice. 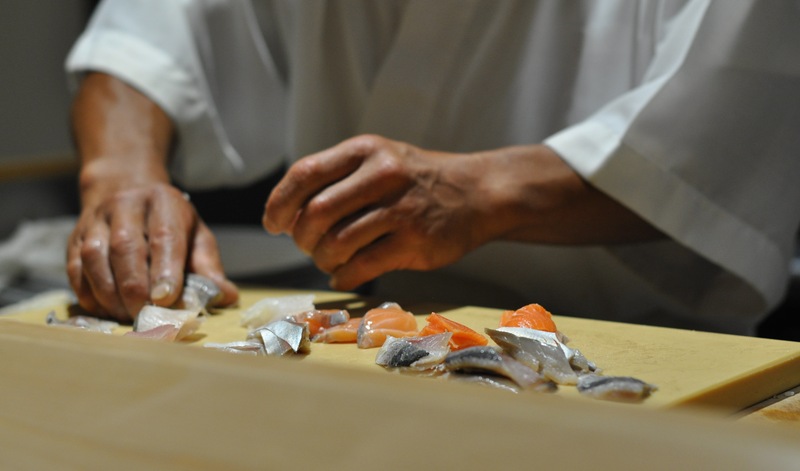 As you can see from above, he adds and adjusts seasonings to create a balance of flavors in each bite, depending on the fish’s innate oils, sweetness, fat, and texture. There is no dogged adherence to tradition here. Chef Yasuda is a cowboy of the sushi landscape in Tokyo, a land of unwavering adherence to sushi dogma. Because of this, he is well loved and respected, and at the same time, criticized by traditionalists. I can’t comment as to which is better or worse, right or wrong. 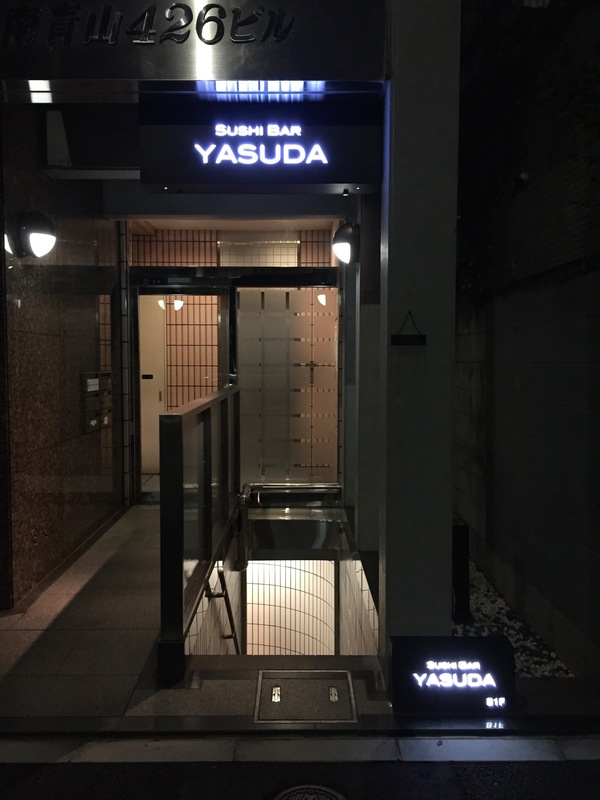 What is apparent however, is that Yasuda enjoys doing things his own way, and the result is a massive following of loyal customers. The proof is in the pudding…or more appropriately, in the sushi. We thanked Chef Yasuda for our full bellies and the sushi lesson, and vouched to return very soon. Which we will happily do, time and time again. Hours: Tues–Sat 6:00 pm to 11:00 pm (Last order 10:30 pm) / Notice of Summer 2015 closings here. Yasuda San Is Yasuda San. His humor, honesty, uniqueness have remained the same as in Manhattan. It is great to see him here in tokyo. He is right. Sushi bar experience does not need to be seriously solemn. 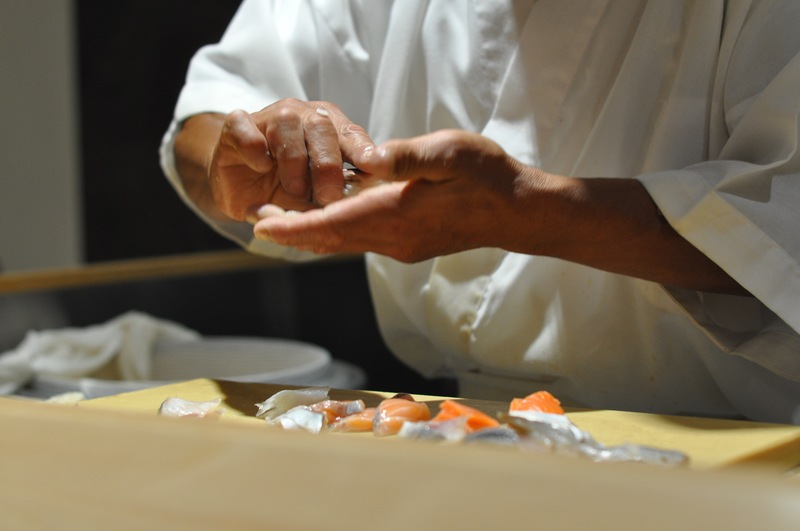 Sushi is not about just fresh fish, but about rice along with interaction between the creator and the observer. I see him as an artist who is creating his own interpretation of reality and truth about Sushi dining. Yes, He should be proud of himself as an accomplished sushi chef in Manhattan. 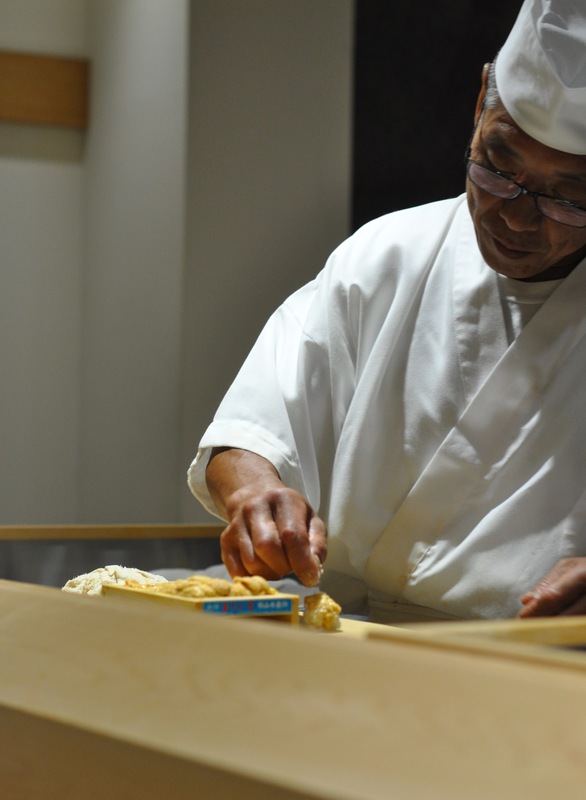 He loves to share with his customers about his philosophy of sushi, life in general in humerus way. 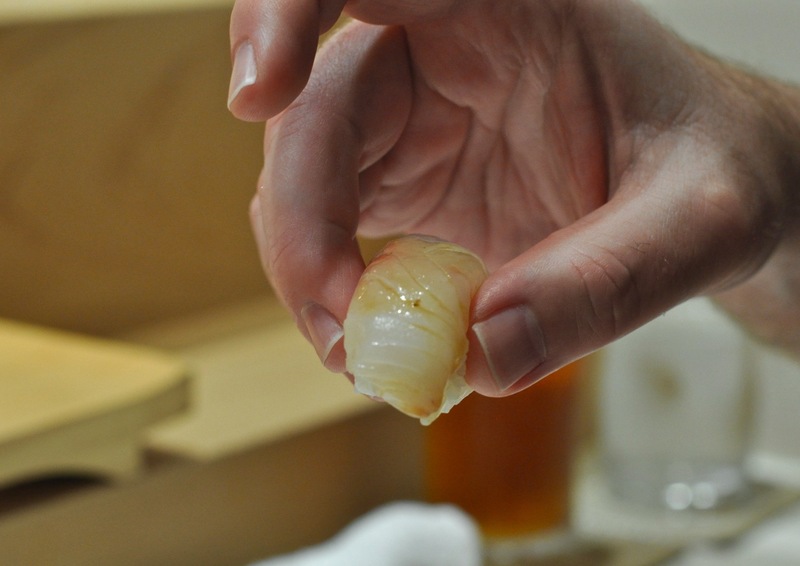 He brings new air to Tokyo sushi scene. He was a proudly New Yorker, living there for 27 years. He has brought New York spirit to Tokyo. Someone who dares to put his foot a step forward will not regret his life.